Led UX research throughout the product creation process: from big-sky exploratory research to validation research just before launch. Worked on a wide variety of products including: running watches, activity trackers, navigation apps, and sat-navs for scooters. Successfully designed and conducted research in multiple countries including: UK, US, France, Italy, Germany, and the Netherlands. Promoted from Junior UX Design Researcher at the end of 2015. Created storyboards and wireframes for multiple apps incubated within the Disney Interactive Group. Crafted content specifically for the Japanese market (in Japanese). Conducted usability review of a new Star Wars mobile game. Conducted exploratory and ethnographic research for multiple projects within the Mobile Experience Lab. Worked on consultancy projects for high-profile clients including: Marriott Hotels, the Massachusetts Bay Transit Authority (MBTA), and RAI, Italy’s national broadcasting company. Presented at the Tangible, Embedded, and Embodied Interaction (TEI) conference in Munich, Germany. Acted as a facilitator at a design workshop at the Skolkovo Institute of Science + Technology in Moscow, Russia. Worked in teams to collaboratively conceptualize and create games, interactive narratives, and digital media art related to cultural analysis and social change. Wrote multiple conference proposals and publications related to lab projects. Won an “exemplary distinction” for our publication at the Foundations of Digital Games conference (top 14% of submissions). Contributed ideas to Chimeria, an engine for modeling dynamic and nuanced character identities in games. Kuhn, Virginia, Heather Wipfli, Jason Lipshin, Susana Ruiz. “Collaborative Curricula: Linking Digital Studies and Global Health.” Journal of Interactive Technology + Pedagogy, 2015. Lipshin, Jason, Rodrigo Davies, Erica Deahl, Julie Fischer, Eduardo Marisca, Lingyuxiu Zhong. “The Creative Industries Prototyping Lab: A Design Education Initiative in Lima, Peru.” User Experience: The Magazine of the User Experience Professionals Association, 2014. Lipshin, Jason. “Network Design: A Theory of Scale for Ubiquitous Computing.” S.M. thesis. Massachusetts Institute of Technology, 2014. Casalegno, Federico and Jason Lipshin. SeedMate: Building the Smart Urban Garden (unpublished manuscript, please contact for further information). Harrell, D. Fox, Chong-U Lim, Jason Lipshin, et al. “Playing Mimesis: Engendering Understanding of Social Discrimination with an Interactive Narrative Game.” Electronic Book Review, 2014. Harrell, D. Fox, Chong-U Lim, Jason Lipshin, et al. “Authoring Conversational Narratives in Games with the Chimeria Platform.” Proceedings of Foundations of Digital Games 2014. Ft. Lauderdale, FL. April 3-7, 2014. (exemplary distinction, top 14% of submissions). Casalegno, Federico, Jason Lipshin, Stella Kim, et al. “SeedMate: An Augmented Reality App and Game for Gardening Education.” Proceedings of Tangible, Embodied, and Embedded Interaction (TEI) 2014 (work-in-progress track). Munich, Germany. February 16-19, 2014. Lipshin, Jason. “Casual Labor: How Farmville Converges Consumption, Production, and Play,” Outstanding Academic Papers by Students, Spring 2012. Lipshin, Jason. “Casual Labor: How Farmville Converges Consumption, Production, and Play,” Scribe – USC Writing Program Journal, Fall 2011. Lipshin, Jason. “Communicable Disease: Towards a Political Ontology of the Computer Virus.” Honors in Multimedia Scholarship, B.A. thesis. University of Southern California, 2011. Lipshin, Jason, Fox D. Harrell, Chong-U Lim, et al. “The Chimeria Platform: User Empowerment and the Expression of Social Group Membership Phenomena.” Digital Humanities 2014. Lausanne, Switzerland. July 8-11. 2014. Harrell, Fox D., Jason Lipshin, Chong-U Lim, et al. “Stories of Stigma and Acceptance Using the Chimeria Platform.” 2014 Electronic Literature Organization Conference. University of Wisconsin – Milwaukee. June 19-21, 2014. Lipshin, Jason, Eduardo Marisca, Rodrigo Davies, et al. “The Creative Industries Prototyping Lab.” HASTAC 2014 – Hemispheric Pathways: Critical Makers in International Networks. Lima, Peru. April 24-27, 2014. Casalegno, Federico, Jason Lipshin, Stella Kim, et al. “SeedMate: An Augmented Reality App for Gardening Education.” Tangible, Embodied, and Embedded Interaction (TEI) 2014. Munich, Germany. February 16-19, 2014. Lipshin, Jason. “Data Visualization as Process and Product in Historical Scholarship.” Digital Humanities 2013. University of Nebraska – Lincoln. July 16-19, 2013. Lipshin, Jason. “Visualizing User Interaction in Books, Films, and Games.” Media in Transition 8: Public Media, Private Media. Massachusetts Institute of Technology. May 3-5, 2013. Lipshin, Jason. “Merging Quantitative and Qualitative Approaches to Data Visualization.” HASTAC 2013 — The Storm of Progress: New Horizons, New Narratives, New Codes. York University. April 25-28, 2013. Lipshin, Jason. “DH Methods in the Traditional Dissertation” (panel discussion). DH: The Next Generation. Simmons College. March 15, 2013. Lipshin, Jason. Digital Humanities Roundtable. Remembering, Forgetting, Imagining: The Practices of Memory. Fordham University, March 1-2, 2013. Lipshin, Jason and Jia Zhang. “Visualizing Centuries: Data Visualization and the Comedie-Francaise Registers Project.” Chicago Colloquium on Digital Humanities and Computer Science, University of Chicago, November 17-19, 2012. Lipshin, Jason and Joshua McVeigh-Schultz. “Emerging Methods of Time-Based Metadata Tagging in Media Scholarship: Revisiting the methodology of close analysis through tagging and data visualization.” Society for the Cognitive Study of the Moving Image, Sarah Lawrence College, June 13-16, 2012. The Creative Industries Prototyping Lab (UPC – Universidad Peruana de Ciencias Aplicadas, Lima, Peru, April 2014). 21W.789 – Communicating with Mobile Technology (MIT, Spring 2014). Taught by Frank Bentley, Senior User Experience Researcher at Yahoo. Also has a MOOC component on MIT edX with 20,000+ students. MIT Kelly Douglas Research Fund, Spring 2014. MIT Graduate Student Council Travel Fund, Summer 2013. MIT Comparative Media Studies – Graduate Student Professional Development Fund, Spring 2013 and Spring 2014. Fund for Innovative Undergraduate Teaching (research assistant stipend), Fall 2011. Provost Research Fellowship, Summer 2011. Undergraduate Research Associates Program (research assistant stipend), Summer 2010. Center for Excellence in Teaching Undergraduate Fellow, Fall 2009-Spring 2011. Undergraduate Writers’ Conference – Second Place (Analytical Essay Category) for “Casual Labor: How Farmville Converges Consumption, Production, and Play,” Spring 2011. USC Webfest – First Place (“Imagine”/experimental art category) for “Traffic Archive,” Spring 2011. USC Exceptional Funding, Summer 2009 and 2010. Undergraduate Writers’ Conference – First Place (Analytical Essay Category) for “Hollywood Extras: Avant-Garde and Industry in Pre-Stonewall Gay and Lesbian Cinema,” Spring 2009. “Hackatones y Laboratorios de Prototipado” (an hour long special on the Creative Industries Prototyping Lab). Umbrales, National Television of Peru, June 3, 2014. “The Creative Industries Prototyping Lab at HASTAC 2014.” HASTAC – Humanities, Arts, Science, Technology, Advanced Collaboratory. June 5, 2014. 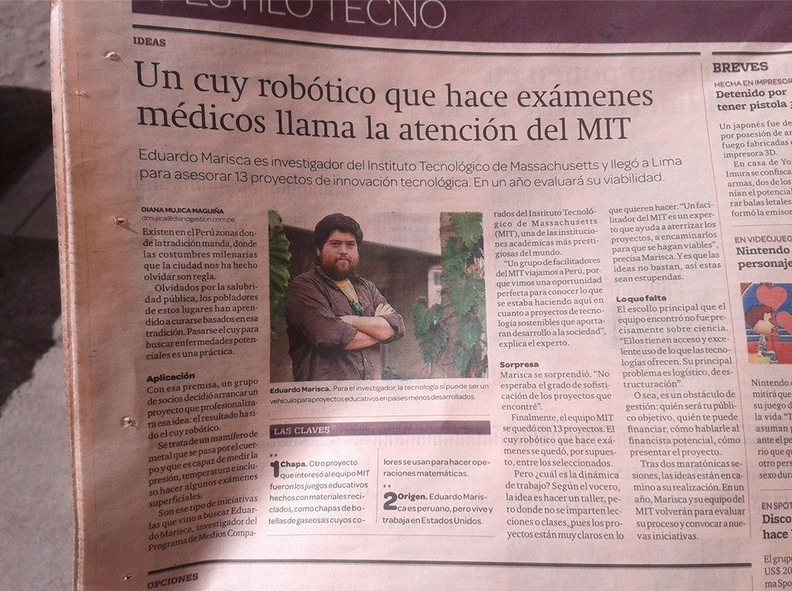 “Un cuy robotico que hace examenes medicos llama la atencion del MIT” (feature article on the Creative Industries Prototyping Lab). Gestion – el Diario de Economia y Negocios de Peru. May 9, 2014. “MIT Students Reinvent the Hotel Lobby” (feature article on the MIT Mobile Experience Lab’s partnership with Marriott Hotels). The Boston Globe. June 22, 2013.